surround sound bar for computer, 40 inch tv, projection screen, receivers home theater, surround sound system for tv, television speakers, tv surround sound systemsThe discount in limited time! The Best small TV soundbar Set Has Just Been Released! Why the Sanwo Voice LP-08 is the Right Choice for you? ●An Amazingly Comfortable fit with Premium Sound! ●Hunting for that Perfect Bluetooth Soundbar? You just found it! 1.You can connect this bar with the device support Bluetooth,when the device got Bluetooth pairing function. 2.For those Non-blueooth device, you can connect device to the soundbar by 3.5mm Audio cable (we have provided that cable already), the soundbar can only support 3.5mm Audio cable for TV,please help to confirm if your TV has 3.5mm audio output. Note: Our sound speaker work with supplied audio cable only, or the same type audio cable. 'using the usb charger from the back of the tv, caused the sound bar to hum. after i changed the charger to a wall fixed the noise. ' say by a savvy customer. Hope this can help you! Start Enjoying Freedom of Wireless Soundbar - Add To Cart Now! ♬ DESIGN BY SANWO --- This soundbar is with unique design makes the sound. It is AntiMagnetic, AntiNoise and HQchipset. With LED indicator light and spin button more easy to operate. With built-in microphone, you can even use this speaker for answering calls. ♬ WORK FOR AUDIO OUTPUT DEVICE --- Sanwo Sound bars, modern and traditional devices work with 3 connection modes: Bluetooth (effective distance:10 meters/33 feet), TF Card Plugging in and wired connections include 3.5mm Audio & RCA AUX input. PLEASE REMEMBER THAT DIGITAL AUDIO PORT ARE NOT SUPPORTED. ♬ TRUE HIGH-QUALITY SOUND --- Powered by 2 x 5W drivers, distortion-free at maximum volume.Super bass stereo soundbar, noise reduction effect, perfect for home, dorm room, kitchen, bathroom, car, parties. 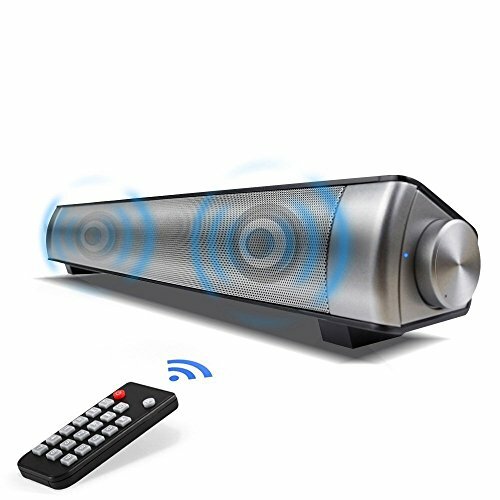 ♬ REMOTE CONTROL & SPIN BUTTION --- Dual operation of bluetooth sound bar which offers high grade convenient one knob control and a remote to adjust playback settings including volume adjustment and track selection. ♬ WHAT YOU GET --- Bluetooth Small Soundbar Speaker, Micro USB cable, 3.5mm audio cable, user manual, Remote Control, Charger, our provide12-month warranty and friendly customer service.